The three budget Stamina treadmills are a breeze to set up and are quite user friendly. They are ideal for people who want a very light duty treadmill in their home but don’t want to deal with a heavy motorized machine. Founded in 1987, Stamina Products Inc. have found a niche in the fitness equipment market by concentrating on building budget machines for mass market retail outlets. In addition to treadmills, exercise bikes, and ellipticals, they make affordable info-mercial products including Body by Jake®, Suzanne Somers, Tony Little, Cosmopolitan®, Brenda DyGraf, Denise Austin and BodyShaping®. One of Stamina’s best products is the AeroPilates® Performer, which is a competitively-priced Reformer machine used for home Pilates exercises. There are three manual Stamina treadmills currently on the market. They feature dual weighted flywheels to give you a smooth and non-jarring moving belt on which you control the pace by your own walking speed. The compact InMotion manual treadmill has a 12 3/8" x 41" walking deck and a 51-lb frame. The InMotion II has a 17" x 42" deck and a 56-lb frame. They sell for $109 and $149 respectively. The InMotion T900 has a longer and wider tread belt (22" x 44") which is suitable for larger users. It sells for $199. Each machine offers two incline settings at 8-degrees and 10-degrees so you can make the workout more challenging by setting the incline higher. These models also come with an easy-to-use LED monitor that shows workout stats such as time and distance, and they are backed by a one-year frame warranty and a 90-day parts warranty. While you might think the cheap prices on these manual models sound too good to be true, you may be impressed by the number of average and above average remarks users give them in reviews. 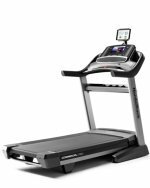 They are by far the lowest priced manual treadmills on the market and offer surprising value for the money. Keep in mind that these machines are for light use only (20 minutes a day, several times a week), but if you don’t need a powered treadmill with all sorts of flashy console feedback, these Stamina treadmills are a good choice. Stamina InMotion Manual Treadmill - Not a quality machine by any stretch but it is certainly usable for light use, very portable, and easy to assemble. Stamina InMotion II Manual Treadmill - Requires no motor so you can use it anywhere, anytime, and it easily folds up and can be wheeled out of the way when not in use.